The land that the country of Egypt now occupies emerged during the Cenozoic period (some 65 million years ago), when the current configuration of continents was being formed. For several million years geological forces were at work, forming the topographical features that were the precursors of what we see today. For hundreds of thousands of years Egypt was covered by a vast ocean, called Tethys by geologists, that gradually drained off to form what is now known as the Mediterranean Sea, leaving a land consisting of layers of granite covered by layers of sandstone and limestone. Many of the sea creatures that were denizens of the ocean were trapped in these newly formed rock layers and became fossilized. It was perhaps the discovery of such fossils that helped engender ancient peoples’ views of mythological beasts and divine creatures. The early part of the Cenozoic era (starting about 30 million years ago and continuing through about 500,000 years ago) can be characterised as a time of dramatic climatic variation, with torrential rainfalls feeding precursors of the modern Nile River, and carving up parts of the land, creating the wadis (valleys) that riddle the surface of Egypt today. About 10 million years ago in the late Miocene, a deep north to south furrowcut through the land and formed the first Nile, known as the Eonile. Over time, the river became known as the Paleonile (c. 300,000–180,000 bp), the Prenile (c. 800,000–400,000 bp), and, finally, the Nile as we know it (from c. 12,000 bp to the present). These earlier phases of the Nile did not follow the same physical course as the current Nile, and might even be considered to have been three different rivers. The groove carved through the landscape by the Nile reveals the different rock formations that had been created over time. Most of Egypt, from north to south, consists of limestone beds. At Gebel Silsilah, near Aswan, this morphology changes to sandstone, with granite emerging at Aswan and along the Red Sea coast. In these early periods of Egyptian history the bed of the Nile was much higher than it is at present, and the Delta was tiny although it was gradually extended by deposits of soil brought from Upper Egypt by successive Nile floods. on both sides of the river as its levels fluctuated and its course changed. Prior to c. 90,000 bp, the whole of Egypt was a much wetter and greener place than it is today. Much more of the country was habitable then, not just the areas along both sides of the Nile and around the oases, as became true later. The land supported a more diverse flora and fauna than is seen today, with acacia forests and different species of grasses, reeds, rushes, and flowering plants, and a vast range of animals, including lions and leopards, monkeys, elephants, hippopotami, rhinoceri, giraffes, foxes, hyenae, wolves, several kinds of antelope, and wild cattle, and hundreds of species of fish and birds, including ostriches. Many of these species persisted well beyond the Pharaonic period (c. 3050–30 bc), with, for example, hippopotami becoming completely extinct in Egypt only in the late 1800s! Ancient Egyptians called their country Kmt, meaning the Black Land, after the colour of the fertile soil deposited annually by the Nile floods. Egypt was also known as Tawy, or the Two Lands, referring to Upper and Lower Egypt, as well as perhaps to the ‘black land’ of the Nile Valley and the ‘red land’ of the surrounding deserts. Another designation for Egypt was the ‘Two Banks’, referring to both sides of the river, as well as to the desert and the flood plain. The word Egypt is derived from the area’s Greek name, Aegyptos, which may have had its origins in the mispronunciation of the ancient Egyptian name for the city of Memphis, hwt-ka-Ptah (the dwelling of the soul of the god Ptah). As a result of the Greeks’ habit of pronouncing only some of its letters, the ancient name for Memphis may have morphed into Aegyptos. The modern Arabic name for Egypt is Misr, which means land or fortress and refers to the fortifications on Egyptian soil near Cairo. crude shelters, and rock art, found on the higher terraces along the Nile and in the oases. By 5000 bc, there was a further push by early people to settle along the river as outlying areas became increasingly desiccated, although still able to support considerable wildlife. This movement of hitherto nomadic hunter-gatherers to the Nile Valley presaged a new and settled lifestyle, one based on agriculture and domesticated livestock, such as sheep, goats, and cattle. 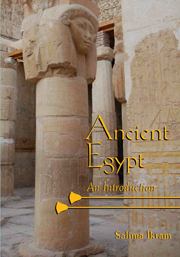 It was during this period of its history that much of Egypt’s culture was conceived and established. Egypt’s now essentially dry climate remained fairly stable throughout most of the Old Kingdom (c. 2663–2160 bc), after which time there were further intermittent climatic fluctuation. Geographically, Egypt can be divided into five main regions that are defined by their relationship to the Nile River: the Nile Valley, the Delta, the Eastern Desert, the Western Desert, and the Sinai Peninsula. Each has a unique character based on its geography, which has influenced not only the development of each area but also the history of Egypt as a whole. Figure 2. The Nile is bordered by fertile black soil that supports lush vegetation. Beyond the margins of this soil is the ‘red land’, or desert, that is inhospitable to humans and most animals. It is possible to put one foot upon the black fertile soil and the other on the barren desert sand. Stark limestone cliffs enclose the Nile Valley and the low desert on either side, providing a natural boundary for those living within the Valley. Photo Salima Ikram. Mediterranean Sea. Until the development of seafaring, the Mediterranean acted as a natural boundary, and even after, because of its tides, currents, and winds, the Nile could be navigated only with care. The Egyptian name for the Mediterranean Sea was wadj-wer, meaning ‘the Great Green’, or ‘shen-wer’, translated as ‘the Great Encircler’. Figure 3. The tip of Elephantine Island at Aswan with a felucca steering around the island. Just further south of Elephantine lie the densely scattered treacherous granite rocks of the First Cataract, which marks the southern boundary of Egypt. Photo Salima Ikram. the north of Luxor, and the flood plain enlarges dramatically. North, in the Delta, the Nile diverges into several branches and sub-branches before emptying into the sea. During the Graeco-Roman period seven major branches are recorded; now only two of these (Rosetta or Rashid, and Damietta or Damyat) survive. Figure 4. The inundation at Dahshur, with the village encircled by the flood and the pyramids in the background. Photo courtesy of Lehnert and Landrock. The rich, fertile, black soil that the Nile deposited in the flood plain gave Egypt its ancient Egyptian name, Kmt, referring to the black land that together with Deshret, the desert or red land, made up ancient Egypt. Although alien and threatening, the desert was nonetheless a part of Egypt, providing a contrast and balance to the flood plain, as well as a source of mineral wealth. Not only was the silt from the Nile useful in agriculture but it also provided the Egyptians with the raw material for their ceramic industry and for the mud bricks that were the main component of their domestic architecture. Of course, care had to be exercised to keep the settlements along the Nile well out of the reach of the floods. Villages were frequently located either away from the river or on the natural high dikes constituting the Nile’s bank, and cemeteries were located in the desert, well beyond the flood plain. As will be discussed, in the Delta the problem was avoided by founding towns and cities on high parcels of ground that effectively became islands during the annual inundations. The rhythm of the Nile also directed the Egyptian year. The Egyptian calendar was based on the inundation, with the year being divided into three basic seasons: akhet or ‘inundation’, which lasted from June through September/October; peret or ‘coming forth’ or ‘growing’, when the land emerged from the water and could be tilled, lasting from October to mid-February; and shemu or ‘drought’, when the crops ripened and were harvested, lasting approximately from February to June. The New Year festival coincided with the advent of the flood. This event was linked to the very bright star, Sothis (probably modern Sirius, the dog star), which vanished from the sky for a period of seventy days in the late spring and whose reappearance in the sky marked the arrival of the inundation. The Nile also defined the Egyptians’ sense of direction: they viewed their origins as coming from the south, the source of the Nile, and so they considered the south to be a ‘head’ for the country. Figure 5. Boats transported people, animals, and goods along the length of the Nile until quite recently. This 5th Dynasty scene from a tomb at Saqqara shows boats loaded with pottery vessels and sacks. Photo Salima Ikram. Egyptians. The plants that grew alongside the river, such as papyrus, reeds, lotus, and lily, all contributed to the Egyptian economy. (Fig. 6.) Parts of the papyrus and lotus could be used for food; additionally, papyrus became the source for papermaking. Reeds and rushes, together with papyrus, were the raw materials the Egyptians used for building houses, shelters, and boats and for making baskets, mats, and sandals. Egyptian theology and iconography were also derived from the Nile. The inundation that renewed the land was a symbol for rebirth and re-creation, and the river itself was part of the divine landscape. The lush growth of papyrus in the wetlands of Lower Egypt made it that region’s titular plant, while the lotus and the lily became associated with Upper Egypt, where they were commonly found; thus each half of the country was identified by the riverine growth common to it. During the last one hundred years or so, with the construction of a series of dams and barrages in the area of Aswan, and with an ever-increasing population, the climate and geography of Egypt have been in flux. The dams have saved Egypt from famine and provided it with the power and electricity vital to economic growth. Even though the Nile still rises, the river no longer floods the land and washes out the salts in the soil. Large amounts of fertilizer must now be added for the land to be productive. The Delta suffers, as there is no reinforcement of the land by fresh silt deposits, and its marine life has less to sustain it. Salts in the soil dissolve and rise up through the groundwater, decreasing the land’s fertility. The salts also cause problems for Egypt’s ancient monuments. The stones of the ancient temples absorb the salts, and as the stones dry in the sun, the salt precipitates, leaving a deposit that ultimately undermines the strength of the rock and destroys the reliefs and paintings that may decorate it. Archaeologists are struggling to record and to conserve monuments whilst they can, and environmentalists are seeking ways to balance the needs of Egypt’s heritage and its living population. Figure 6. Lotus, or lilies, and papyrus used to be commonly found in Egypt. They have both been reintroduced, and the latter is used to make sheets of papyrus. Photo Salima Ikram. to the ancient Egyptians, and the Delta as Ta-mehu (see the next section), its complement. In modern terms, Upper Egypt is the area south of Beni Suef, and Lower Egypt is the area north of Beni Suef, although in ancient times the division between the two parts of the country lay further north near ancient Memphis. Physically, the Nile Valley is characterised by its narrowness: it is rarely wider than five kilometres, and at some points it is reduced to the river itself and a narrow strip of cultivation adjoining the river’s course. Generally, in southern Upper Egypt the wider flood plain is located on the east bank and the more narrow area is on the west. This fact may have contributed to the Egyptians’ decision to found the majority of their settlements in Upper Egypt on the eastern side of the river, although there are also metaphysical reasons for this choice (see Chapters 5, 7, and 9). Upper Egypt can be divided into two sections, one more northern than the other, which is sometimes called Middle Egypt today. The northern part of Upper Egypt is the area between Asyut and Cairo. This section of the Nile Valley is rich agricultural land and is broader than areas further south, measuring from 15 to 25 kilometres or more in width. In contrast to Upper Egypt, in Middle Egypt the majority of arable land lies to the west of the river. Perhaps this is why some of the settlements in this area were established in the west rather than in the east. Figure 8. This image of Wadjet and Nekhbet, the two titular deities of Lower and Upper Egypt, respectively, comes from Hibis Temple. Wadjet, the cobra goddess who ruled over Lower Egypt, is shown wearing the Red Crown and is balanced upon a papyrus plant, the plant symbolic of her domain. Nekhbet, the vulture goddess who presided over Upper Egypt, wears the White Crown and is balanced upon a lily/lotus, the plant that symbolised Upper Egypt. Each goddess holds out ankh signs to the names of the king, giving him eternal life. Photo Salima Ikram.